If you want to avoid the risks of fat belly and want to have a fit and healthy body you need to have a proper diet, proper rest and proper exercise. Yoga is a highly effective form of exercise which helps people to relax their body and to achieve flexibility in their body. Practicing specific yoga asana helps to reduce belly fat and achieve stronger looking abdominal muscles. People with pot belly are more prone to back injuries as well. 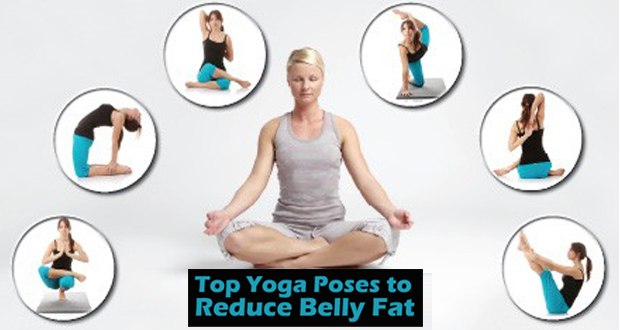 You can avoid many health risks with the help of yoga asanas to reduce belly fat. It has been found that yoga asanas targeting the core or abdominal area are more effective in removing belly fat than the crunches. Having belly fat will affect the overall appearance of the person and this may affect the self-confidence of the person. Whether you want to reduce belly fat for health reasons or for achieving a better looking body, you can opt for the various yoga asanas to reduce belly fat. Here are some of the top yoga asanas to achieve flat looking belly. Both men and women can practice these yoga asanas to achieve the required result. If you are new to yoga do not go too hard from the beginning. Start with simple yoga exercise poses and move on to more complex ones. Avoiding rushing or making any jerky movements while doing the asanas. It is best to start your yoga practice with the help of a trainer, however the following asanas are easy to understand and practice. You will be able to control your body and mind in a better way when you start to practice the asanas apart from being able to reduce the fat deposits in the belly.